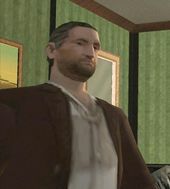 Mike is a minor character in the Grand Theft Auto series who appears as a minor character in Grand Theft Auto: San Andreas and in The Introduction (both set in 1992). He is a member of the Leone Family. He does not speak in his appearances. Mike, presumably born in Liberty City, joined the Leone Family at an unknown time and later became the bodyguard of Salvatore Leone, including for his time in Las Venturas after he invested money in Caligula's Palace. Mike appears briefly in The Introduction and Freefall in the background, quietly following Salvatore. This page was last modified on 9 November 2013, at 21:48.